Inspiration can come from the most unlikely of places. 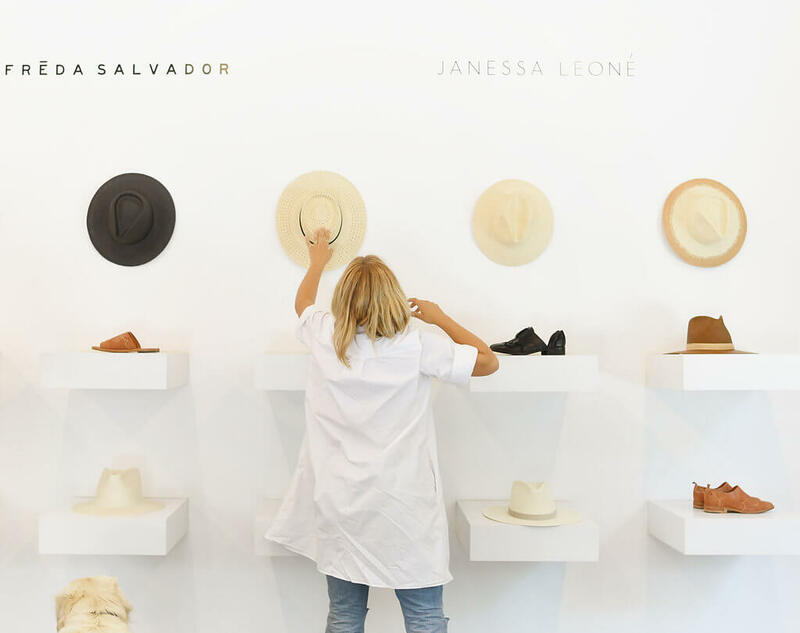 For businesswoman Janessa Leoné, it was a dusty black fedora in a thrift shop in Paris. Using traditional millinery techniques, she creates classic handmade pieces loved by style icons such as Kendall Jenner, Rosie Huntington-Whitley, Jessica Alba, and Beyoncé. In our delightful interview, we chatted about breaking into the fashion industry, the challenges of being a CEO, and the importance of a good self-care routine. 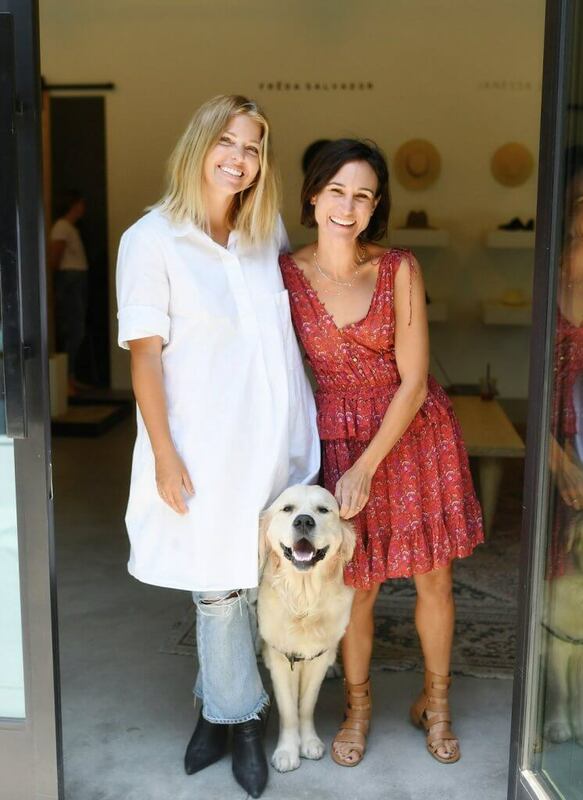 Melissa: How did you get started in the hat business and why specifically hats? Janessa: Well, it was supposed to be everything else. Haha! I really wanted to do clothing, that was kind of like my big goal. And it still kind of is. I want it to be like a lifestyle brand. But, I still am self-funded. I looked into doing the sampling, pattern making, and everything but it was just not attainable. I really wanted to do fine linens, silks, and nice fabrics, but it was just not something that I could do. I studied English literature, I was supposed to go to law school. That was the path. When I graduated, I was having anxiety about what I was going to do. I went to Paris for my college graduation trip with my boyfriend and then I found a great hat. It sparked the idea of hats being my foot-in to the industry. That was 8 years ago. At that time, there was Bespoke and Brixton, but there wasn’t a handmade hat that was accessible and fashion forward. So, I found a factory that does all the hand making and uses the traditional millinery techniques. 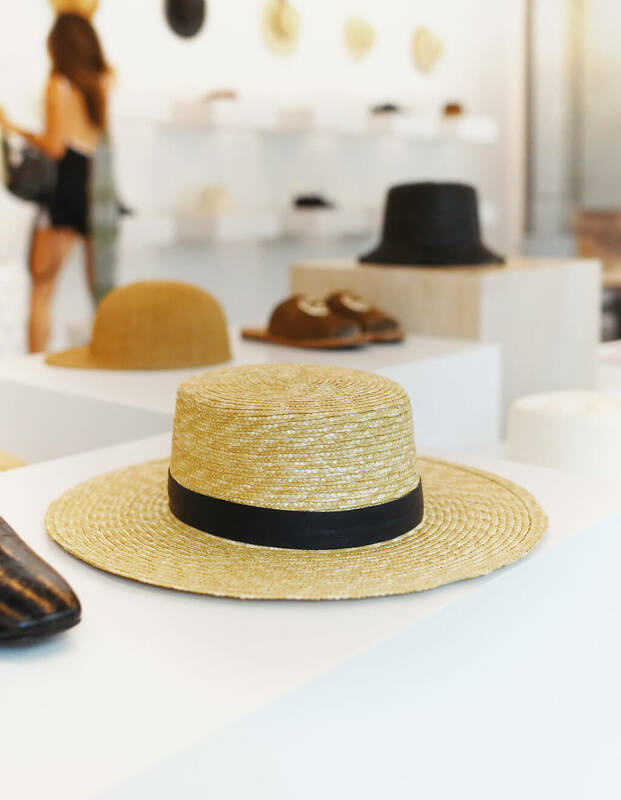 We can do it at scale, so that we don’t charge $900 for a hat, which is the typical price for a Bespoke hat. We use the same techniques, and obviously it’s still at a luxury price point, but it is more accessible. You can go to Barney’s and Nordstrom to find it. You don’t have to scour every shop in Paris to find it. Melissa: Did you just come upon the hat or did you have a mission? Janessa: No, I came upon the hat. It’s funny because I was in this tiny little thrift shop and had got a bunch of clothes and I was in the checkout line and I looked up. My boyfriend speaks French, so I asked him to ask the owner to get the hat down. It was covered in dust and he was like, “no, that’s ugly. Don’t buy the hat.” And I was like, “I promise you, this is a cool hat.” And I wore it everywhere, and I started shipping that hat around, like “how do I make this?” The answer pretty much was that it is a dead craft. It’s not something people can do anymore. This was a traditional dress hat from the 30’s. There’s no one who could do that anymore. I did research for about 2 years before I got my first samples. One guy who was up in Burbank, L.A. said “let’s look at who made this hat.” Underneath the silk there was the milliner’s name and his last name was Leone. I mean Leone is a very common Italian name, but it was still very serendipitous. I just thought this was meant to be. I really love the idea that Chanel had started with hats before they got momentum. I didn’t have friends in the fashion world or connections, and it’s hard to break through. So, I decided to start with a niche product, breakthrough, get a name for myself, and then we can expand from there. That’s what we are currently in the process of doing. It’s a slow process because we are still funding ourselves and growing as we can. There are limitations to every business. M: You’re obviously a lover of hats. Out of your hats, which is your favorite? J: I really love the straw hats. The wheat braid bolero is one our classic lines and I wear that all the time. It has classic, French Riviera vibes. It’s sadly been knocked off by just about everyone, even down to the screw in the back. This is one of our signature hats and one of our first straw hats that put us on the map. M: Where do you draw your inspiration from for all your different designs? Where do you source your materials? J: My philosophy is that I like to create a creative practice that gives space to inspiration coming from anywhere. There must be a lot of structure in my self-care routine and structure in making sure I’m sketching every day to really hone in on the skill set, so when the inspiration comes, I can really capitalize on it. I love drawing inspiration from travel, but also run a business so I can’t travel all the time. I love being outside in nature, and I like to just create the space. I like going to galleries to observe art, try to dissect it and trying to understand what I like about it. 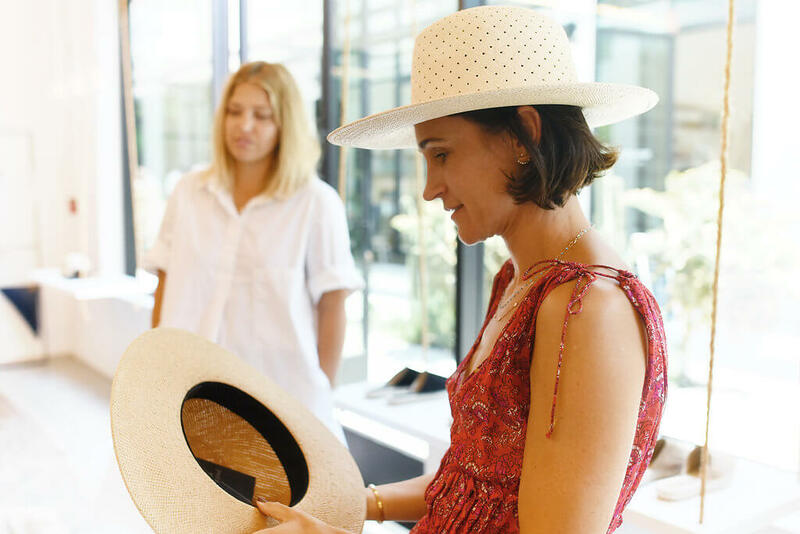 M: How many hats did you launch with when you first launched the collection, and what did that look like? J: It was only one shape in two colors because I had minimums that I couldn’t meet. I brought them in from the factory completely blank and then trimmed them into six different styles. I named all of them after neighborhoods in Paris in honor of where I found the first hat. I had a friend who sent it to an editor, Hillary Kerr, founder of Who What Wear, and she was a huge supporter. She called me into her office and gave me advice and sent it out to her editor friends and then it kind of grew. At this time, I was working as a nanny. I was nannying for the first three years of my business. I even had employees and I was going to work as a nanny so that I could pay their salaries. M: What does a day in your life look like? Share your daily rituals! J: My morning routine is quite strict. I see it as “what’s going to be the best recipe to put out the most productive day?” I wake up every morning at 7am, I keep my phone on airplane mode all night until I’m ready to leave for the office. I am not looking at my phone or emails. I get up in the morning, pray, meditate, do quiet things, take the dog for a walk, andmake coffee, I really like a quiet morning. I don’t go into the office until 10am. It’s usually chaos. I have a fantastic team that manages pretty much every aspect of the business, but there is still so much that I oversee. I do that for 2 hours and at 12pm I have an alarm that goes off every day to meditate. I shut my door, everyone knows to not bother me. It’s a notable shift in the day from business manager to creative. Sometimes the second half of the day also integrates with business because I have a production team who I translate ideas to and whatnot. The second half of the day I play it by ear. And it depends on the process. Right now, it’s a huge design development time because market is in September. I am pretty much in the office working on samples. A month ago, it was much more the inspiration process, so going to the beach or going to a book store. It kind of evolves which is so good for my personality because I don’t like things being stagnant. I like structure to the point that it gives me freedom, but I don’t like to feel captive by it. It flows. M: How often to you launch a new collection? J: We have 4 collections per year. Spring-summer and fall-winter are the big collections and then we do capsule collections throughout the year. M: If you could only wear one accessory for the rest of your life what would it be? J: Sunglasses. I love sunglasses. I usually keep the same accessories, for example I wear the same rings and necklaces every day, but I have a bunch of sunglasses and I like to switch those out. M: What was the biggest challenge about creating your company? J: Managing people is a struggle for me. I feel like I’m pretty much the stereotypical creative person, who likes to be free and I don’t like to be tied down. As soon as you get employees who depend on you, it’s very hard to find the balance between creative and boss. That’s an ongoing struggle. I think just constantly giving myself some space to be like “okay, you might not be the perfect boss. You might not be the CEO on Forbes, but you’re doing what you can and you’re doing a good job,” and still find that time to create. At the end of the day, our products are our lifeblood. If you don’t have good products, then it doesn’t matter how good of a manager I am, I’d have nothing to manage. M: Is this your only store? J: This is our only retail store. M: Do you want to open more stores? Do more of e-commerce or wholesale? J: I see our e-commerce and our store channel in the same bucket. It’s more about the customer experience. We really shifted two years ago to focus more in that direct channel. That’s when we opened the store and really beefed up our online store because we were only wholesale before. I am so grateful for our wholesale partners and we are where we are because of them, but it’s so hard for a customer to get the idea of your brand on first introduction when you’re mixed in with so many other brands. They don’t get the idea or the story. I see our brand as much more than hats and the handbags. I love having a store. I’d love to open more but we just take baby steps. Slow and steady is our motto. M: You are quite popular among the A-listers. Do you remember the first time you saw a celebrity wearing one of your creations? J: We sent Rosie Huntington-Whitley hats and she wore and loved them. She sent me this huge bouquet of flowers for my birthday which said, “thank you so much for the hats and happy birthday!” I was in this tiny apartment and I literally had this employee literally working on my bed. I didn’t even have a separate space and I’m getting these things. Obviously, she had no idea I was like scrounging my pennies in this hot apartment with no AC. That was a really cool moment. I loved that. M: Is there anywhere that you want to travel to on your bucket list? J: I just got back from France. I love France. It’s kind of like my boyfriend and my special place, so we just went for the first time together to the south riviera and my next collection will have a lot of French vibes. But I really want to go on a safari in Africa. I am such an animal lover. My boyfriend says he won’t take me because I’ll literally jump out and get eaten by lions because I’m going to try to cuddle them! I think that would be a good way to go! Ha-ha! I’d be so happy just cuddling a little cub and then getting mauled. Ha-ha! M: Is there any accessory that you never leave home without? J: My necklace. My dad passed away suddenly two years ago, and one of his last texts to me was about business. He was my CFO. One of his last texts was just saying to stay happy and hopeful, and it’s all going to be okay. He passed away the next morning. My boyfriend engraved it on this necklace and it’s just such a special thing for me. It just says, “stay happy and hopeful.” I never take it off. Even though he is not physically here, he is still such a presence in my life and we were so close. That bond doesn’t really go away. M: What is the next item you want to launch, outside of hats? J: Right now, I am so focused on interiors. I love the idea of your space really affecting your quality of life. People don’t notice when they’re at dinner using beautiful ceramics that there has been so much thought put into a table-scape. It really changes people’s mood and it’s so thoughtful and there is so much extra energy that shifts when there is so many thoughtful little things in someone’s house. I love the idea that well-designed small things can really make a difference in your day to day life. We don’t have something in the works to design but long-term I would love to get into that space. In September we are completely redoing the store to be more of a design conscious type of living space.